Sometimes, elimination reactions occur instead of aliphatic nucleophilic substitutions. In an elimination reaction, instead of connecting to the electrophilic carbon, the nucleophile takes a proton from the next carbon away from it. The halide or other leaving group is still displaced. A double bond forms between the two carbons. Thus, there are actually more than two competing mechanisms occurring at once here. In addition to unimolecular and bimolecular substitution, a reaction involving deprotonation is also possible. Draw a mechanism for the elimination reaction above. Assume the reaction is bimolecular. The mechanism of an elimination reaction is almost exactly the same as an aliphatic nucleophilic substitution, except that the nucelophile misses its mark. It hits a proton instead of a carbon and acts as a base instead of a nucleophile. This process can happen at the same time as the leaving group's departure or it can happen afterwards. These mechanisms are called E1 and E2. Draw another mechanism for the elimination reaction above, but this time, suppose the reaction is unimolecular. Given the mechanism in NS12.2., other products would also be expected. What does their absence suggest about the mechanism of the reaction? Why might a reaction undergo elimination rather than substitution? The most important reason concerns the nature of the nucleophile. The more basic the nucleophile, the more likely it will induce elimination. Basic nucleophiles lead to elimination. Very strong bases include carbon and nitrogen anions and semi-anions. Examples include butyllithium and sodium amide. Very strong bases are highly likely to engage in elimination, rather than substitution. Strong bases include non-stabilized oxygen anions. Examples include sodium hydroxide as well as alkoxides such as potassium tert-butoxide or sodium ethoxide. Strong bases favour elimination, too. Nevertheless, they can sometimes undergo either elimination or substitution, depending on other factors (see below). Weak bases include cyanide, stabilized oxygen anions such as carboxylates and aryloxides, fluoride ion and neutral amines. Weak bases are much more likely to undergo substitution than elimination. Very weak bases include heavy halides such as chloride, bromide or iodide, as well as phosphorus and sulfur nucleophiles. Very weak bases undergo elimination only rarely. Typically, strong bases and very strong bases are more likely to react via the E2 mechanism; they react so quickly that the deprotonation step triggers C-LGp ionization, rather than the other way around. However, E1 mechanisms also occur with these bases, especially at low concentrations. Explain why. Why is it that an anion such as cyanide is a weak base, whereas CH3Li is a strong base? Give two reasons. Another factor is sterics. The more crowded the electyrophile, the more likely the nucleophile will encounter a proton on its way to the electrophilic carbon. As a nucleophile approaches tert-butyl bromide, coming from the side opposite the bromine in order to undergo nucleophilic substitution, it is pretty likely to collide with a proton on its way to the electrophilic carbon. The same thing has a good chance of happening with iso-propyl bromide. However, it is much less likely to happen with bromoethane. Finally, bromomethane doesn't even have a beta-hydrogen, so the chance of elimination in that case is zero. Note that the crowding could involve either the structure of the base or the structure of the electrophile. A large, bulky base may be more likely to deprotonate than find its way in to the electrophilic carbon atom. 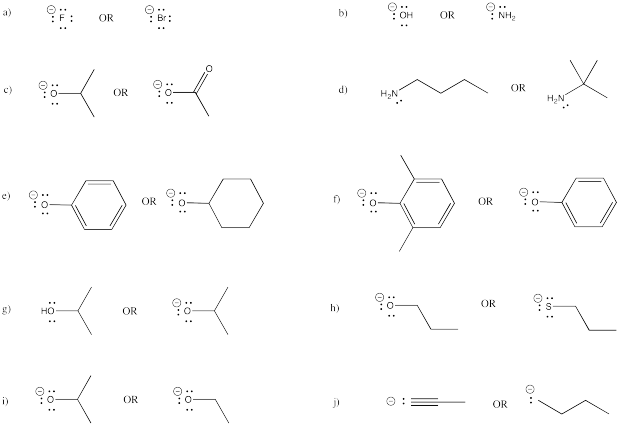 Given the following pairs of nucleophiles, which one is more likely to undergo elimination? Although acetylides (such as sodium acetylide, Na CCH) are actually more basic than alkoxides (such as sodium isopropoxide, Na OCH(CH3)2), acetylides frequently undergo substitution rather than elimination. Propose a reason for this difference. A third factor is temperature. An elimination reaction involves the cleavage of two bonds, whereas a substitution reaction requires only one bond to break. Thus, an elimination reaction is more energy-intensive, and it is more likely to occur at higher temperatures, when more energy is available. Higher temperatures lead to elimination. An additional factor in the energy dependence of eliminations and substitutions is entropy. Use simple rules about to determine which products are favoured by entropy: Elimination or substitution? Given the relationship ΔG = ΔH - T ΔS, which thermodynamic factor dominates free energy change at high temperature? Therefore, which product is favoured at high temperature?